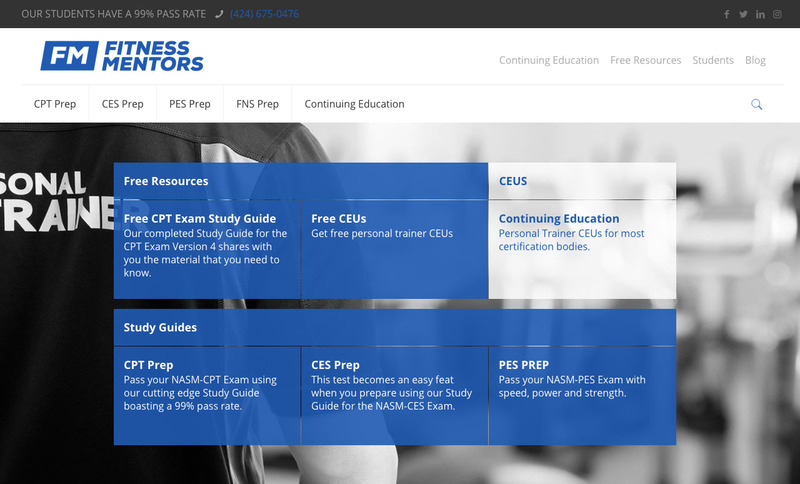 Fitness Mentors is a personal trainer education site that provides aspiring personal trainers and existing trainers educational materials that help them pass certification exams. As a small ecommerce-based business with competitors ranging from international corporations to hugely popular blogging sites, Fitness Mentors has stood out as a leading provider of the most comprehensive suite of educational materials on the market. Fitness Mentors owner Eddie Lester knew he had a premium product before he teamed with Digital Elevator, but knew he lacked the website and high-level SEO campaign he needed to compete and achieve his goals. After several discovery sessions with Digital Elevator President and Founder Daniel Lofaso, it was determined that a new professionally branded website with a focus on user experience and fully engaged SEO campaign would help Fitness Mentors make the push they wanted. The first step in helping Fitness Mentors build upon their trust of potential and existing clients was to completely rebrand their website. We wanted to make something that looked really corporate, yet with that academia-infused factor that encouraged trust and confidence. The website was rebuilt completely and featured the clean navigation and mobile-friendly features you see today. It concentrates heavily on the site’s free educational materials that natural segue products that push visitors towards their premium suite of products. Gains Aren’t Only for the Gym! Digital Elevator focuses heavily on content marketing and helped Fitness Mentors create blogs that would later be used as linkable assets. Most of the fitness industry is reluctant to link to educational materials but are often happy to link to well-written blogs. Rather than focusing on sheer quantity of blogs, we focused on long-form content that covered topics that had proven to be competitive and highly linked to on other sites. Once we created the best content on the web, we then performed outreach to many of the link partners the competitive articles had developed and formed relationships with them as well. We took this a step further and made relationships with other niche and shoulder niche sites, also earning links back to Fitness Mentors’ blog in the process, helping to improve their PageRank and Domain Authority while simultaneously improving the rankings of the entire site. In addition to the creation of keyword focused blogs and outreach, we also created a wealth of infographics. Our most successful campaign involved an infographic on work-life balance, a topic that often involves personal trainers. This infographic got picked up by a large number of professional and industry sites and helped us drive some PageRank 6 backlinks and 100s of social shares. This is all the more impressive considering how small Fitness Mentors’ niche really is, catering only to personal trainers seeking a very specific certification. I hit the jackpot when I hired Digital Elevator for their SEO services about 7 months ago. Daniel from (DE) is truly a Search Engine Optimization expert. His communication and responsiveness are impeccable and his work ethic far exceeds expectation. Since beginning with Digital Elevator, my revenue doubled in two months, which easily covers the cost of the monthly service. Now through seven months my business has grown over 350%. My knowledge of business development and SEO has exponentially expanded, and their ability to explain what we are doing and why has been a great educational experience. I would highly recommend all businesses to utilize Digital Elevator. The results for Fitness Mentors really speak for themselves. Shortly after launching the new website and implementing some solid on-page SEO strategies, their revenue doubled in two months, easily allowing the company to justify the costs of our services. We are always transparent with the client about the limitations of our services and told him that it would be unlikely to outrank the actual personal trainer certification body itself. However, for nearly every keyword that we are going after (based on products and Google Webmaster Tools search data) we are either just after the certification body, and in many cases, above them.